An unusual injury following an arm wrestle is presented, that of a fractured humerus. Arm wrestling is an enjoyable ego boosting sport, but it is not benign and should not be attempted on a competitively serious level by those who are not regularly trained arm wrestlers. This patient was an otherwise fit 24 year old chartered surveyor, who was admitted to casualty with a swollen painful right arm. He was a well built muscular man who had drunk 3 pints of beer before embarking on a one off arm wrestle challenge with an equally built yet taller man (and hence with longer forearms), who regularly arm wrestled. His only medication was ventolin and becotide inhalers for mild asthma. The patient was in an offensive (winning) position for the first 30 seconds approximately, then the wrestle was restarted because each wrestler wanted to regain a comfortable sitting position. The patient was then in the neutral to defensive position for about ten seconds when he felt his arm give way and crack with excruciating pain while defending at an obtuse angle of about 100° (where neutral is regarded as 90°). Examination disclosed a tender dominant right arm just above the elbow, with distal neurovascularity intact. 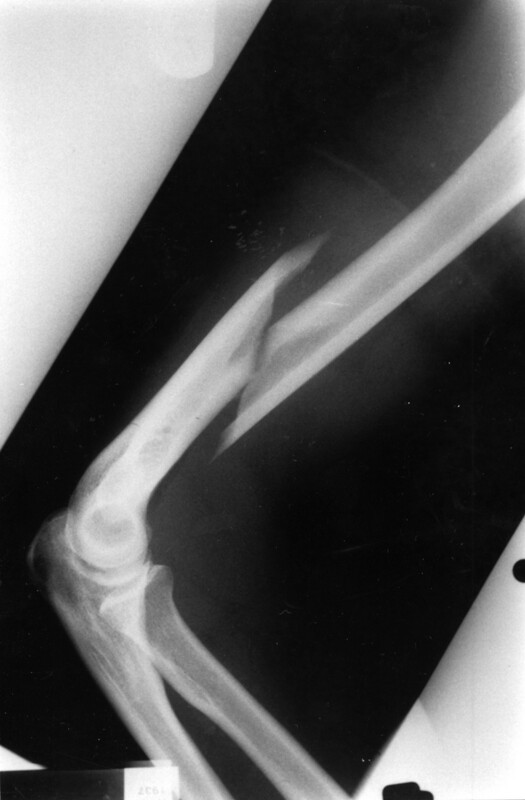 Radiographs of the elbow showed a short spiral fracture of the distal third of the humerus (fig 1). Lateral elbow radiograph showing short spiral fracture of the humerus (right side). Fracture of the humerus following an arm wrestle in a young fit man is a rare occurrence,1 as is fracture-separation of the medial humeral epicondyle in adolescents.2 The shoulder joint is actively internally rotated against the opponent while the elbow is fixed in flexion, resulting in enormous violent torque forces across the humeral shaft.3 This patient's diet was adequate with no evidence of nutritional deficiency. Usually the musculotendinous structures are the limiting factor in arm wrestling, but in this particular case they were not, either because the proprioceptive awareness of the patient was reduced because of the alcohol and late night and/or he was overmuscular for his bony size, in the sense that, although he was generally muscular, he did not have the humeral cortical bone hypertrophy to match his muscularity because he was not a regular arm wrestler.4 Furthermore, his opponent had a longer forearm and consequently a moment-torque advantage. This type of arm wrestling injury tends to occur when one arm wrestler tries to force the match in an effort to win or to change the tide of the contest. This results in the defending arm wrestler taking or being forced to take a posture in which his centre of gravity and therefore his body weight has shifted. As the offensive wrestler continues with the attack, the defender's internal rotator shoulder muscles suddenly and passively stretch and change from their maximally concentric contraction to an eccentric compensatory contraction, resulting in an intense rotational force with subsequent humeral fracture.2,5 This fracture was treated by means of a collar and cuff in a net body bandage. Heilbronner DM, Manoli A 2nd, Morawa LG. Fractures of the humerus in arm wrestlers. Clin Orthop1980;149:169–71. Ogawa K, Ui M. Fracture-separation of the medial humeral epicondyle caused by arm wrestling. J Trauma1996;41:494–7. deBarros JW, Oliveira DJ. Fractures of the humerus in arm wrestling. Int Orthop1995;196:390–1. Jones HH, Priest JD, Hayes WC, et al. Humeral hypertrophy in response to exercise. J Bone Joint Surg [Am]1977;59:204–8. Ogawa K, Ui M. Humeral shaft fracture sustained during arm wrestling: report on 30 cases and review of the literature. J Trauma1997;42:243–6.